The best body lotion is one that is healthful for your body and skin. Commercial lotions claim they soften, smooth, moisturize and offer a multitude of beautiful skin care results. Is the lotion really healthy for you, though? Your skin is the largest organ of your body. What you put on it gets into your body, affecting your health. Often, commercial products contain harsh manufactured ingredients that cause poor body and skin conditions. A healthful lotion is free of harsh chemicals, mild and gentle, leaving skin close to its natural pH level. Goats milk contains natural vitamins A, B, C, D, E and K! It aids in the regeneration of collagen under the skin. It negates visible signs of aging, such as fine lines or wrinkles. Goats milk is a buffer leaving skin close to its natural pH level. It has moisture attracting properties, soothing for dry flaky skin. 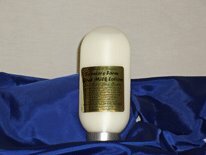 Goats milk lotion is handcrafted into a variety of scents. Look for lotions that have natural extracts instead of synthetic fragrances. Natural fragrance oils: peppermint and orange are popular in goat milk lotions. Some fragrances may be irritating, especially to sensitive skin. In this case, an au natural, fragrance free, lotion may be better. A goat milk lotion with olive oil for skin helps renew skin cells, soothe inflammation and moisturize. A lotion containing rosemary oil is softening and invigorating. Commercial and homemade lotion contain preservatives, but what type are used? Parabens are a class of chemicals used to remove bacteria and fungi. They're found in many consumer products. These chemicals are very controversial. Some studies report an indirect correlation between the presence of parabens and the occurrence of breast cancer. It's believed that parabens can migrate into breast tissue and form tumors. Finding a lotion with a paraben-free preservative would be the wisest choice. When making your own goat milk homemade lotion, do not trust that grapefruit seed oil and rosemary oil will keep bacteria, yeast and fungi at bay, in a milk emulsion. Make sure to keep your homemade lotion safe from biological contamination. Use your chosen added preservative as determined by the manufacturer. Goats milk lotion needs to be stored in a cool location. An air conditioned room is adequate. Goats milk does not not hold up in extreme heat. Do not store this lotion in a warm environment, due to the possibility of rancidity. Use this lotion within 6 months. Do not use it beyond 1 year of purchase. The shelf life of this lotion will extend if the unopened container is stored in a refrigerator.